Chewing is a normal behavior for dogs, just as breathing or eating are normal. In the wild, chewing keeps a dog's teeth clean and ready for action, and thousands of years of domestication haven't changed that. As a veterinarian, I know that dogs still love to chew, and I'm sure you know it, too. Chewing has lots of beneficial effects on the teeth if done right, and it helps keeps dogs happy and prevents some destructive tendencies that can creep up when a dog is bored. But chewing sometimes has a downside, too. Your dog may chew things you wish he'd leave alone: shoes, furniture, even parts of your house. More than one dog has chewed his way out of a room when left alone and scared. And sometimes chewing leads to health problems for dogs, including broken teeth and intestinal obstruction. Here are a few expert-recommended ways for you to keep your dog's chewing appropriate and healthy. Give your dog the right things to chew on. Never give a puppy an old shoe to chew on! Dogs may be smart, but they can't tell the difference between your kid's old soccer shoe and your $100 work shoes. By training your dog to chew appropriately, you lessen the likelihood that he'll go after anything you'd like to keep intact, like your furniture or other possessions. Don't give your dog beef and other hard animal bones. I have seen too many broken teeth in my practice. 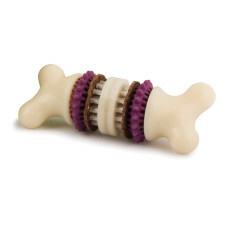 The best treats that will satisfy the urge to chew but protect your dog from harm are firm but not hard treats like the indigo™ Fresh Floss Bones. These can be chewed on, but are not as hard as a beef bone. Similarly, a cloth toy that can be shredded and eaten is asking for trouble. Many, many dogs have to have expensive and risky intestinal surgery to remove these toys once eaten. Train your dog to select the right chew toys and avoid the wrong ones. Positive reinforcement works very well to train dogs to do the right thing, and clicker training, where a reward for good behavior is linked to the noise from a small, hand-held clicker, is an easy way to send the message "Good boy - that's the right thing to chew on." Aversion training can be used in some cases, but more often than not, just providing dogs with the right thing to chew on and positively reinforcing when they play with it will get them moving in the right direction. Spend more time together. Couple chew toys with a fun activity like grooming at home, watching TV, or playing. This will only deepen the bond between you and your dog, and will help make sure to satisfy your dog's urge to chew while protecting your things from damage. Watch your dog's behavior to learn why he chews. This is a great activity for puppies and dogs who haven't learned what they can and can't chew. Hang out with your dog and watch his chewing behavior. Give your dog an appropriate toy or treat. Praise him when he uses his toy or treat instead of the couch or your shoes. You might even notice some behavior that tells you he's about to go chew something bad. Maybe your cat is taunting him from the ledge and he gets frustrated when he can't play with the kitty. Or maybe he always chews before dinner because he's hungry and anticipating his next meal. With a little planning and a little preparation, you can make sure that your dog gets his chew on, and you still have something to wear to work in the morning. Here's to happy chewing and healthy teeth! Nylon: Not Just for Chewing!